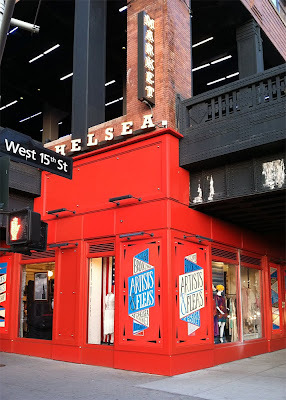 Artists & Fleas has created a unique exterior for their Chelsea Market pop-up shop, by choosing a bright palette of tomato with blue and yellow, painted by a crafty Brooklyn duo. The hand lettering of the signage, which repeats on panels wrapping the corner of 15th and tenth, has a retro feel to it, a bit like a traveling circus. Artists & Fleas at Chelsea Market is located on the corner of 15th and Tenth, and is open 7 days a week, 10-7pm. Artists & Fleas, the Williamsburg shopping mecca that set the standard for the current New York market scene as we know it today, returns to New York's Chelsea Market for a 3 month Spring season showcase, after a triumphant holiday pop-up in December. 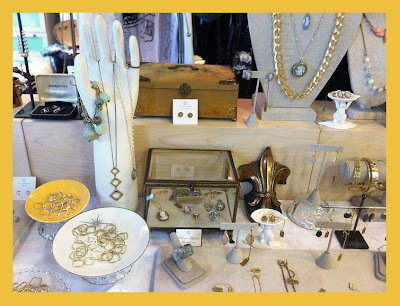 Cynthia Rybakoff will be a featured independent designer at the market, along with a hand picked group of Brooklyn's most compelling artists, designers and vintage dealers. Stop by to view the Spring 2012 collection, located beneath New York's celebrated High Line at 15th and Tenth, and treat yourself at one of Chelsea Market's delectable eateries.